The Backstage emulates the sound, high output, warmth and "push back" of tube amplifiers and includes features such as high and low EQ controls, a 6 inch heavy-duty speaker, switchable TransTube overdrive, a Aux input for jamming along to your favorite songs and a headphone input for doing so quietly. Guitar Player reviewer Barry Cleveland raves about the tone and value of the Backstage in his March 2004 hands-on product review. "This is easily one of the best-sounding mini amps I've ever heard," he writes. "It delivers a great assortment of tube-like tones and offers excellent dynamic response, all in a pint-sized package and for a very modest price. "The key is Peavey's exclusive TransTube technology, which emulates the sound of tube amplifiers without the hassle or cost of dealing with unpredictable tubes. The TransTube preamp tailors the gain level for any amount of drive, from clean to crunch to scream, using a patented approach to emulating 12AX7 tubes and their ability to create even, harmonic distortion. It also mimics the "push back" response of real tube circuitry, which is essential to emulating tube dynamics, distortion and chime. Package Includes: . (1) Peavey Backstage 10w Combo Guitar Amplifier w/ 8" speaker+2 Switchable Channels. (1) Rockville RCGT20B 20' 1/4'' TS to 1/4'' TS Instrument Cable-Black 100% Copper. 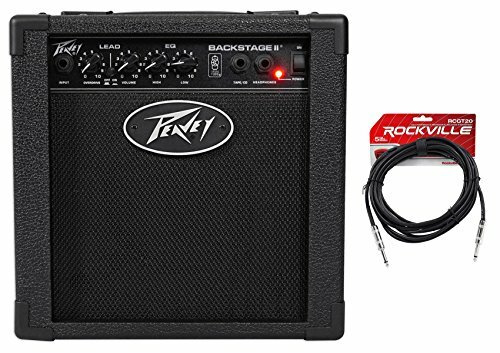 Peavey Backstage 10w Combo Guitar Amplifier w/ 8" speaker+2 Switchable Channels. 6 inch custom designed speaker. TransTube preamp with 2 switchable channels. Volume and Overdrive controls. 2-band EQ. Aux input for practice. Headphone jack. 10 watts (rms). Rockville RCGT20 1/4'' TS to 1/4'' TS Guitar / Instrument Cable. 24 AWG 100% Copper Conductors for Enhanced Signal Clarity. Nickel Plated, 1/4" Straight-to-Same Connectors. High Density 90% Coverage OFC Braid Shield for Superior EMI and RFI rejection. Length: 20 Ft. Color: Black.